Enjoy a unique China Black. 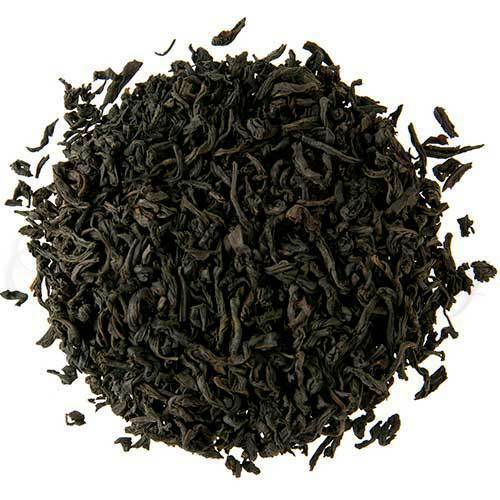 This superior leaf Lapsang Souchong offers a crisp character with the remarkable and heady aroma of an oak fire. Manufacture Type(s): Orthodox (Traditional leafy), Small batch crafted. Cup Characteristics: A superior leaf Lapsang Souchong offering a crisp character with the remarkable and heady aroma of an oak fire. Certainly a unique tea. Infusion: Tending bright with reddish hues. Pairing Suggestions: Baklava, Salty and Spicy dishes, Muenster cheese, Gorgonzola cheese. This special smoked tea has a distinctive flavor sometimes referred to as tarry, and is a special tea from Fujian province. The Fukienese word ‘souchong’ means sub variety – that is a sub variety of other black teas from the Wuyi Mountains of Fujian. When Lapsang Souchong was first exported to western European countries and became famous on the international markets – it was no doubt due to the distinct aroma and flavor. Interestingly the best Lapsang is produced in the nature preserve located in the Wuyi Mountains where the high mountains with thick pine forests and heavy mist provide the ideal environment for growing top quality tea.